VIRAL VIDEO: A School Girl was Defamed and Punched by a Rude Guy in a UV Express! Ladies should always be respected. But this idea has been a subject of debates since men, ironically, are also shouting for gender equality. The guys insist that they don't need to offer a seat to a girl who is not pregnant or "differently-abled" in a public vehicle because they also paid for their slot. There are also a few husbands who are asking for justice since they allegedly experienced abuse from their wives. This is an ongoing topic that needs to be resolved. 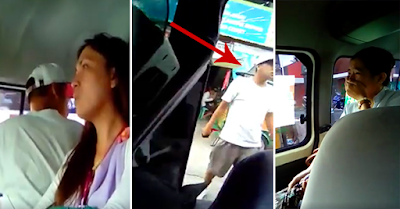 However, on the video that has been viral for a few hours now, it can clearly be seen that this ill-mannered and vulgar guy should learn his own lesson. 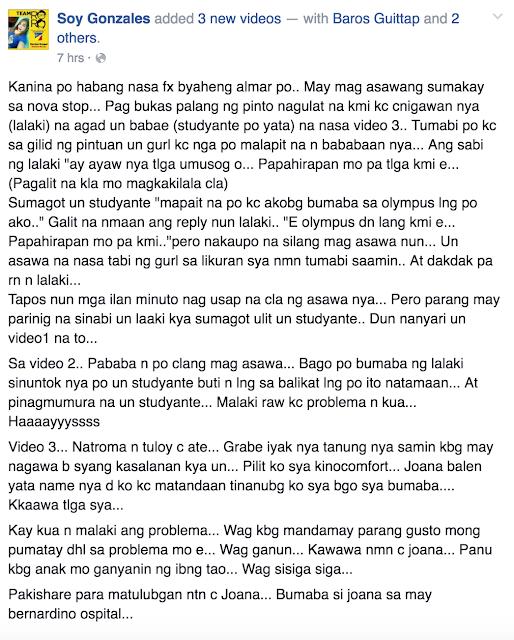 From a Facebook post of Soy Gonzales, she narrated how a school girl experienced being defamed and physically abused by a certain guy. Gonzales is a concerned citizen who recorded the scene from her mobile phone. There are 3 parts and you will surely get to your nerves as you view them.